Samsung says glasses-free 3D unlikely in next 10 years | What Hi-Fi? 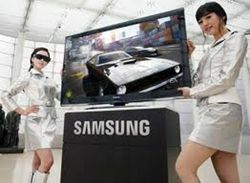 The Korean company says manufacturing costs and technical issues will make glasses-free 3D TV "difficult"
Samsung has poured cold water on rivals' promises to deliver 3D TV without the need for glasses, by stating it thinks it unlikely it will produce such a set in the next 10 years. Toshiba has been bullish about its glasses-free 3D TV plans, promising a set within this financial year, but Samsung sees too many obstacles to back the technology. In a statement given to US website SlashGear, the company said making such a set with enough viewing angles to be practical – 32, in Samsung's opinion – would take some five years of R&D. The company also said current manufacturing costs would have to come down and TV broadcasters would have to upgrade. The company concluded that "attempts to put glasses-free 3D TV to market within the next 10 years will be difficult". Samsung itself has backed active 3D TV technology and recently announced its 2011 range – and you can read our first review in the April issue on sale now.